HOMESTEAD, Fla. -- Luck was on Tom Rahill's side last weekend as he loaded up his canoe in preparation for the day's hunt. A cold front had passed over the south Florida Everglades a day earlier, bringing rain and cool temperatures. And as a hunter of Burmese pythons, he suspected the snakes would be basking in the sun, easy to find. "We're gonna catch a bunch of snakes. That's the mission," his hunting partner, 30-year-old Jorge Martinez, said. 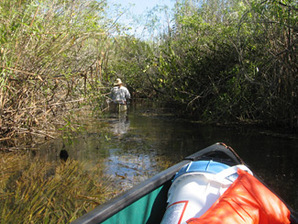 Tom Rahill paddles down a canal in the Everglades in search of Burmese pythons as part of the 2013 Python Challenge. The canal runs along the border between land owned by the South Florida Water Management District and the Everglades National Park. All photos by Jessica Estepa. But that simple goal does not translate into easy practice, even for Rahill, a 55-year-old Broward County resident who has been roaming the Everglades since 1975 and catching pythons since they started appearing in the region. The only way to locate the snakes, Rahill says, is to spot them in the thick vegetation. It's as much about luck as it is about skill. Before the trip last weekend, Rahill had captured two snakes: Alfreda and Blue. Rahill insisted on naming them alphabetically, like hurricanes. Now, they were looking for snake No. 3: Cecilia. "Cecilia, I wanna feel ya," Martinez sang. "Cecilia, we're not gonna kill ya." An hour into their expedition along a canal that runs the border between Everglades National Park and land owned by the South Florida Water Management District, they passed through a shady lagoon, and Rahill stood up. They were near the spot where he had caught the first two pythons. It was time for footwork. Rahill began the search while Martinez brought his motorized canoe to the shore. But before Martinez had stepped onto the bank, the shout came. "We got one! Come on, buddy!" Rahill exclaimed. He emerged from the brush seconds later, grasping an 8-foot python with both hands and urging Martinez to grab the netted bag. The pair worked swiftly to secure Cecilia. Once the snake was in Martinez's canoe, they resumed their search, and three minutes after they caught the first snake, they bagged a second: 13 feet long and much larger than the first. Her name was Delilah. The two catches marked the beginning of a suite of baggings for Rahill. Two days later, he caught snake No. 5, Elijah. Three days after that, Frankie was in his possession. Tom Rahill, right, works with Jorge Martinez to bag the Burmese python caught seconds before in the Everglades. The pair is participating in the 2013 Python Challenge. 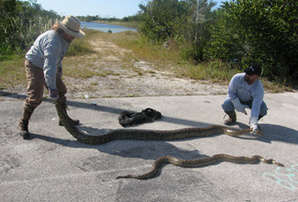 Rahill and Martinez are participating in the 2013 Python Challenge, a monthlong contest sponsored by the Florida Fish and Wildlife Conservation Commission in an effort to remove the invasive Burmese python from the Everglades. Since Jan. 12, more than 1,500 people have registered to hunt the invasive species. Armed with netted bags, machetes and guns, they have traipsed around the undeveloped areas of south Florida to come out on top. Divided into two groups -- the general public and permit holders -- registrants can win cash prizes for bagging the most snakes and for bagging the longest snake. As of today, hunters had caught 50 pythons. Rahill -- a telecommunications consultant when he's not out in the Everglades -- and Martinez -- a veteran who is now studying airplane maintenance at Miami-Dade Community College -- were out last weekend to represent the Swamp Apes, a volunteer group led by Rahill that encourages veterans and locals to work on environmental cleanup projects around south Florida. Their trip was the group's seventh hunting venture since the challenge began. Though Rahill and the Swamp Apes have now caught six pythons, they aren't qualified to win the prize. They have one rule about their captures: They won't kill them. In order to win, contestants have to turn over dead snakes to Florida's FWC and the University of Florida. Instead, the volunteer group is live-capturing the animals and handing them over to officials. It's a point of pride for Rahill. If they bring the snakes in alive, scientists can make the call to humanely euthanize the snakes in a lab or keep them alive for other purposes. At least one snake, Delilah, may be kept alive for research; she's believed to be "gravid," or impregnated. Besides, Rahill said, winning was never the group's goal. He wants to use the competition to get the word out about the Swamp Apes. He has a deal with the wildlife commission: If his group captures enough pythons, he'll get to speak about the group's mission to help veterans and the environment during the python hunt's closing ceremony next weekend. He's planning to hunt today, tomorrow and Sunday -- all throughout the last weekend of the challenge -- to boost his numbers. The group's other main purpose in participating in the hunt is to get veterans like Martinez outdoors, doing things they've never done before and never expected to do. For Martinez, that unexpected moment came while the pair were examining Cecilia and Delilah later in the day. He and Rahill had taken the snakes out on an old road that ran near the canal, showing them off to passersby. The smaller snake, Cecilia, had gone back into its bag with ease. But the 13-footer, Delilah, put up a fight, hissing and snapping at Rahill. Rahill made a few attempts to catch the snake by throwing a bag over its head, but to no avail. Instead, Martinez recaptured the snake by making a fast move to grasp the snake below its jaw. "I felt like Crocodile Dundee," he said afterward. "I felt strong like Steve Irwin. That was the first time I caught a snake. ... After Delilah, I don't think I'm afraid of snakes anymore." In August 1992, Hurricane Andrew wreaked havoc in south Florida, killing 15 people, destroying homes and buildings and leaving more than 1 million people without power. After Hurricane Katrina, it was the second-costliest storm in the country's history. And, according to some, it may have had another consequence: releasing dozens of baby Burmese pythons into the Everglades. The story goes that an exotic pet trader's enclosure was destroyed during the storm, setting the snakes and other animals free, wildlife biologist Joe Wasilewski said. He called the alleged spot near Homestead "ground zero" of the python problem. The story is unverified, since no one ever came forward as the pet trader. But at the heart of the legend is the dilemma that scientists have been grappling with: The invasive species -- the population of which is unknown but believed to number in the thousands -- is in the region because of humans. Tom Rahill, left, and Jorge Martinez compare their catches for the 2013 Python Challenge. The smaller snake, Cecilia, measures about 8 feet long. The larger snake, Delilah, is about 13 feet. "Improper cage management or animal housing that blew over -- all of that may or may not have occurred," said Skip Snow, a wildlife biologist with Everglades National Park. "The important part is, they are here because of the commercial trade. ... They didn't come in ships like marine invasives. We brought them here." Scientists say the problem lies with pet owners. They purchase the pythons as hatchlings, not aware of how large they can get. 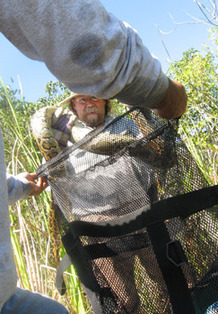 Once they become unmanageable, the owners dump the snakes in the Everglades. It's an ongoing problem that happens with other animals, such as other species of snake, dogs and fish. According to the Florida wildlife agency, Burmese pythons average between 6 and 9 feet long, and the largest caught in south Florida was more than 19 feet. The first time a Burmese python was spotted in the Everglades was in 1979, said Frank Mazzotti, a wildlife ecology professor at the University of Florida. A couple more showed up in 1980s, there was an uptick of sightings in the 1990s, and then, in the past decade, the population exploded exponentially. The effects of having the snakes in the Everglades are still mostly unknown. According to Mazzotti's research, their diet is 75 percent mammals, 22 percent birds and 3 percent alligators. There has been a decline in Everglades mammal populations in recent years, which has often been attributed to the pythons' presence. But until there's hard scientific data to back it up, that's just circumstantial evidence, Mazzotti said. Despite the lack of hard evidence, action needs to be taken now to keep the python problem from getting worse, Mazzotti said. "What rankles me is this notion that we've got prove that invasive species have adverse impacts first," he said. "By the time you can prove that there's an adverse impact, it might be too late to do something about it." For now, it's important to educate the public about the animals and increase awareness about them, as well as remove as many pythons as possible from the wild, scientists said. That's where the python hunting contest comes in. The snake problem has been featured in local media and is known among south Florida residents, but since the challenge began on Jan. 12, it has garnered national media attention and drawn competitors from 38 states, as well as one from Canada. Even Sen. Bill Nelson (D-Fla.) joined the hunt last month, with FWC Commissioner Ron Bergeron leading the way. "When [the state] started discussing the possibility of having the contest, they thought maybe 50 people would sign up," biologist Wasilewski said. NPS's Snow is looking forward to the science that will come out of the ruckus. Once the contest ends, information will be released about not only how many animals were caught, but where hunters concentrated their searches and how many snakes were caught in certain areas. It could help target the response to the pythons. "I just hope we learn something from this," Snow said. "We need to know what went wrong and what we need to do next." While he looked through the tall grass just off Florida's State Route 820, Simon Heavlin explained that he wasn't a fan of some of the people the python contest had drawn in. He described a news segment he saw in which a man from Massachusetts was wielding a machete while his wife wandered around in the background, wearing chest waders. Simon Heavlin, left, and Wendell Ward hike through the Everglades, keeping an eye out for Burmese pythons in the thick vegetation. Those people don't know what they are doing, he said. As a lifelong fan of snakes, the 41-year-old knows how to handle pythons. At his home in Fort Meyers, he keeps 38 snakes, several of which are Burmese pythons, the very snake he's hunting. His day job is at a custom framing shop, but he also hosts an online forum, BurmJunkies.com, for those interested in the creatures to discuss topics such as feeding, housing and breeding. Since the challenge started, Heavlin had been out four times. So far, he had caught only one, a 10-foot python that he hoped would put him in the running for longest snake. But he's taking part in the hunt because, as a python hunting-permit holder, this is something he already does. "Truthfully, I don't care about the money," he said. Heavlin's approach is to search on foot. Wendell Ward, 38, who works in information technology in Naples, was his hunting companion last weekend. They prepared in the car beforehand, putting on sunblock and making sure they had hooks and a bag to hold a captured snake. The pair, followed closely by a documentary crew recording their exploits, wandered along and off gravel paths, stomped through mud and crouched down to look under abandoned pieces of junk. But unlike a week earlier, the only animal they found was a small lizard. The area must have already been searched, Heavlin decided. Searching closer to the area where he had found the first snake -- near Homestead, where Rahill and Martinez caught their snakes a day earlier -- might be the way to go. 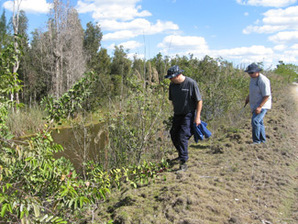 An hour and a half later, Heavlin and Ward were near Everglades National Park, using the same strategy they had before. Heavlin was hopeful: Three hatchlings had been caught, and five python skeletons had been found in the area, indicating the possibility of a nearby nest. But as the sun set and the temperatures dropped, they realized they weren't going to catch anything. "It bothers me that [the lizard] was the only animal we've seen all day," he said. Heavlin decided that the lack of any life, python or otherwise, was because of the cold front that passed through a couple days before -- the same cold front that Rahill thought would make him lucky.